This is a beautiful ornament and the picture doesn't do it justice. This ornament is made of old Christmas cards. 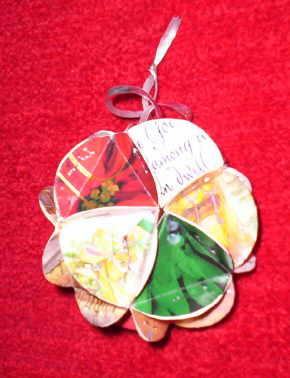 Instead of throwing away those beautiful cards, reuse them as lovely ornaments. Shiny cards can be used to make a shiny ornament or cards of all one color or design can be used. All you need are Christmas cards, scissors, stapler, ruler, and a compass to make sure the circles and measurements all match. Use a compass to make circles on old Christmas cards approximately 2 inches in diameter. You will need 20 circles to make one ornament. Once you have drawn the circles on the cards, make a small mark on the outer edge of the circle and put the point of the compass on that mark. Make sure the compass is still the same measurement as you used for the circle. Swing the compass to the right and make a mark on the right outer edge of the circle then swing it to the left and make a mark on the left outer edge of the circle. Take your ruler and place it on the original mark you made and across the circle. Make a mark on the opposite of the circle from the original mark. Once you have the 3 marks on the outer edge of the circle (forget about the original mark now), you then connect the dots and you will have a triangle. Cut out the circles. Fold up the edges of the circle that are outside of the triangle. You will have 3 flaps folded upwards. Repeat this process on each circle. Once all twenty circles are cut out and the edges folded up you then start stapling the folds together. Start with 5 circles and match the flap from the first circle with the flap from the second circle and staple them together. Staple the opposite flap from the second circle to the flap of the third circle. Staple the opposite flap from the third circle to the flap of the fourth circle. Repeat until all five circles have the flap stapled together to make a domelike shape. Repeat with five more circles and that will be the top dome and bottom dome of your ornament. Staple a circle to each of the remaining flaps on each of your two domes. You will now have two halves of the ornament. Staple these two halves together by the remaining flaps to make a hollow sphere. Punch a hole through any pair of flaps to insert a ribbon for hanging. Copyright © 2007 by Lora Corbin and Julie Corbin. All rights reserved.